The most valuable asset any small business can have is a replenishable source of new customers. A business that can reliably and systematically generate new business has true value. We believe Internet marketing is the most effective way for your small business to feed your business with new opportunities. We’ve seen countless businesses acquire new customers online and we’ve turned this knowledge into a complete website solution for generating leads for your business. How do you convert traffic into leads? A lead is created when a qualified buyer finds a compelling message. It might be something they want or a solution to their problem. There’s an instant of connection, a compelling promise, and a call to action. Our experts will help you shape your website into a tool that repeats this magic over and over again. With your three-month marketing plan, you’ll understand how to feed your lead generation website with quality traffic. 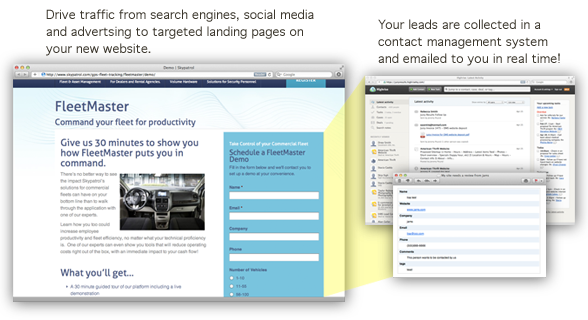 The combination of your new website, contact management system and abundant traffic sources will feed your sales system. Expert help with lead conversion, calls-to-action & lead generation strategy. A good lead system is like a faucet, always able to respond to the volume you need at any time. Your lead generation website is like the pipes that connect your faucet to the water source, directing the traffic where you need it.